Setting New Year’s resolutions is more than just a fun tradition. If you take the time to create actionable goals for yourself, your New Year’s resolutions can be an important tool in promoting a lasting recovery. Most New Year’s resolutions fail because they are too vague or the person making the resolution hasn’t thought about how to achieve their goal. For example, “get in shape” could mean anything from losing 20 pounds to being able to run a 5K. To set effective goals for yourself, follow the principles outlined in the acronym SMART. SPECIFIC: Choose a precise outcome. MEASURABLE: Find a way to measure your progress. ACTION-ORIENTED: Decide what specific steps you will take to reach your goal. REALISTIC: Make sure your goal is achievable given the resources at your disposal. TIMELY: Choose a deadline for completion or a daily, monthly, or weekly repeating timeframe for the task. The SMART goals framework works for both short-term and long-term goals. It is well-suited for people in recovery because it provides concrete suggestions for breaking down the vague goal of getting sober into a series of steps that provide a foundation for success. 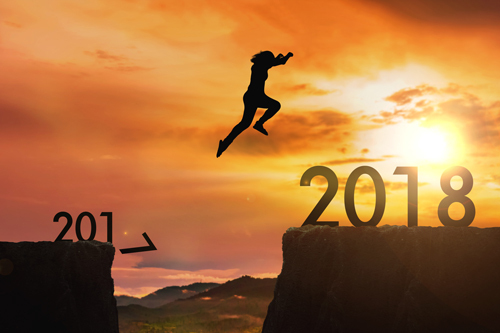 No two people in recovery are exactly alike, but the following 8 New Year’s resolutions will help you brainstorm goals that will inspire you to stay on the path to sobriety. I will write in my journal for 15 minutes each day. Journal writing is an excellent tool for people in recovery to better understand their emotions, what triggers their cravings, and what coping strategies are best suited for their personal needs. I will exercise for 30 minutes per day. Regular exercise helps improve your strength, stamina, and energy levels while releasing natural endorphins. If you’re currently leading a very sedentary lifestyle, try walking or bike riding after dinner and some invigorating yoga in the morning. I will learn a new sober hobby. Part of being in recovery means finding new ways to enjoy your free time without drugs or alcohol. You may choose to attend cooking classes, explore an interest in foreign films, take up watercolor painting, or finally learn to play the guitar. Any interest that you’re passionate about is going to be beneficial to the recovery process. I will attend worship services each week. Increasing your spiritual connection can be a source of great comfort as you adjust to a sober lifestyle. Worship services can also help you expand your social circle, since you are no longer associating with the friends who encouraged you to drink or do drugs. I will schedule quality time with friends and family at least once per week. Repairing relationships after addiction won’t happen overnight, but you can take baby steps towards stronger bonds by treating the time you spend together as a priority to be scheduled in your calendar. Enjoy a home cooked meal, watch a movie together, or break out a fun board game to play. Turn off your phone so there are no distractions, then focus on communicating honestly and openly. I will perform a random act of kindness each day. When you’re struggling with drug or alcohol addiction, you’re so consumed with your substance abuse that it’s impossible to focus on the people around you. Being in recovery requires rediscovering how to be of service to others. Pay for a stranger’s coffee, volunteer at your child’s school, or help an elderly neighbor carry her groceries into her apartment. Finding ways to give back will boost your self-confidence and promote stronger relationships with the people around you. I will ask for help when I need it. Addiction is a chronic illness, not a moral failing caused by a lack of willpower. If you’re feeling the urge to use, call your sponsor. If you are considering skipping a therapy appointment because you don’t have transportation, call a friend who has been supportive of your recovery and ask for a ride. Putting yourself out there may be uncomfortable at first, but it’s a necessary step in the recovery process. I will celebrate my successes and not be critical of my failures. Being committed to recovery requires a growth mindset. You must realize that obstacles are to be expected and that you may make mistakes along the way. This does not mean that you’re a bad person or that the progress you’ve made isn’t important. It simply means you need to take the time to reevaluate your plans and make sure your coping strategies are best suited to your personal needs. For more information about our treatment programs at Waypoint Recovery Center, please contact us anytime at (888) 978-5188. Is Alcoholism Treatment Needed After a DUI?